The pallet stacker range from Manitou is highly versatile, providing easy pallet handling for a variety of warehouse applications. Perfect for any warehouse environment, the pallet stacker is designed to easily manoeuvre through small spaces and gets the job done faster and cost-effectively! Key features of the pallet stacker range include high efficiency and ergonomic designs. The pallet stacker range has lifting capacities up to 2 000 kilograms. Manitou supports its pallet stackers nationally with a world-class service and support network. Manitou helps ensure peak operation and maximum productivity with the help of experienced pallet stacker maintenance teams that are on stand-by 24/7, 365 days a year. Pallet stackers from Manitou also benefit from 95% parts availability - guaranteed! Dedicated pallet stacker service centres are located in Durban, Cape Town and Johannesburg, while serviced areas include the Vaal Triangle, Eastern Cape, KwaZulu-Natal, North West Province and the Freestate, as well as the rest of South Africa. Service is also available in Africa. 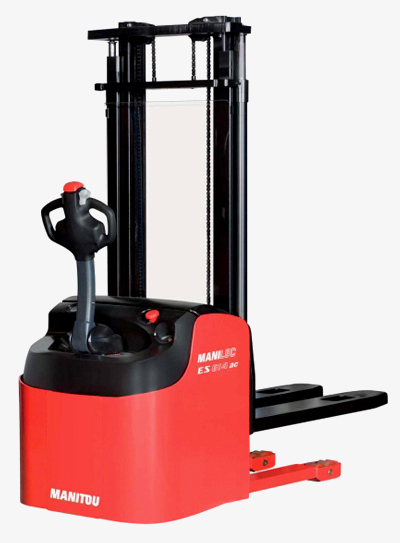 The Manitou range of material handling equipment, comes standard with a 12 month (or 2 000 hour) warranty. Extended warranties are available on request. Read more about our warranty offering. With more than 40 years' experience in the rough terrain handling industry, Manitou can help you tackle any application in the warehouse industry!